For me the biggest kicks of a miniatures game come from the table itself. I really like to field well painted and themed armies on a good looking board. Whether you win or lose, its always a joy to grab a mug of coffee after the battle and just admire the stuff you have laid out on the table. The WW2 wargame Flames of War uses special objectives to determine who wins a battle. These objectives can be represented on the battle board by a plain token or by a more stylized objective marker. While both types will do the trick game-wise, I -and many other gamers as well- find it more visually exciting to use mini-dioramas as objective markers (well, duh!). They can be for example wrecked tanks, crashed airplanes, command bunkers or supply dumps. Anything that will add to the battlefield flavor is a bonus! The only real challenge here is to fit all that on 2 1/2″ X 2″ size base (called Large Base in FoW terms), as the FoW rules dictate that as the size of an objective marker. 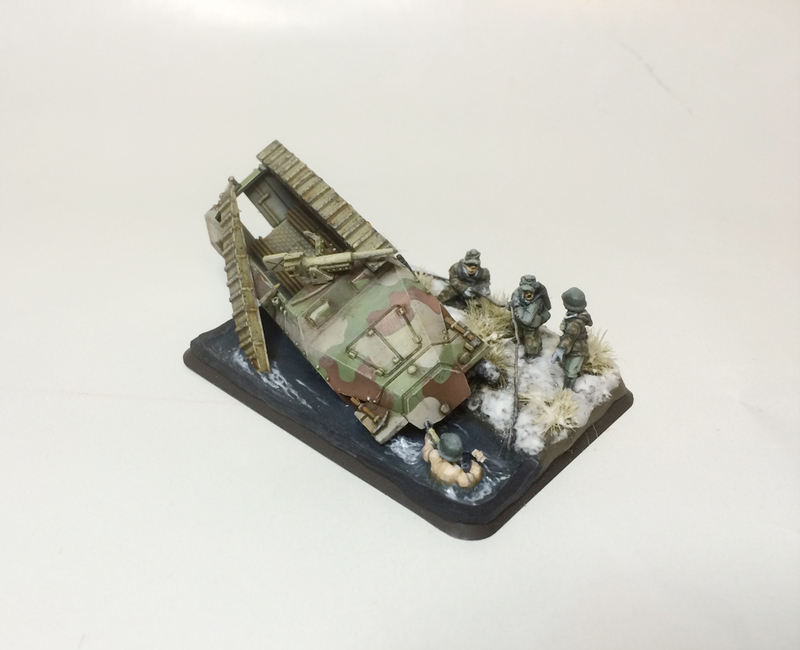 I have been toying with an idea of a “tank in distress”- objective marker for a couple of years now. Having read a ton of wartime tank commanders’ stories they always tell of tanks getting stuck in a ditch, bog, mud or whatever and then having to wait to be towed out, often under enemy fire. I wanted to capture such a situation. I tried to fit various tanks on a Large Base and still have enough room to add the crew who try to unf**k the situation. It seemed like everything I tried was either too large or just too unwieldy for the purpose and therefore the project was delayed time and again. 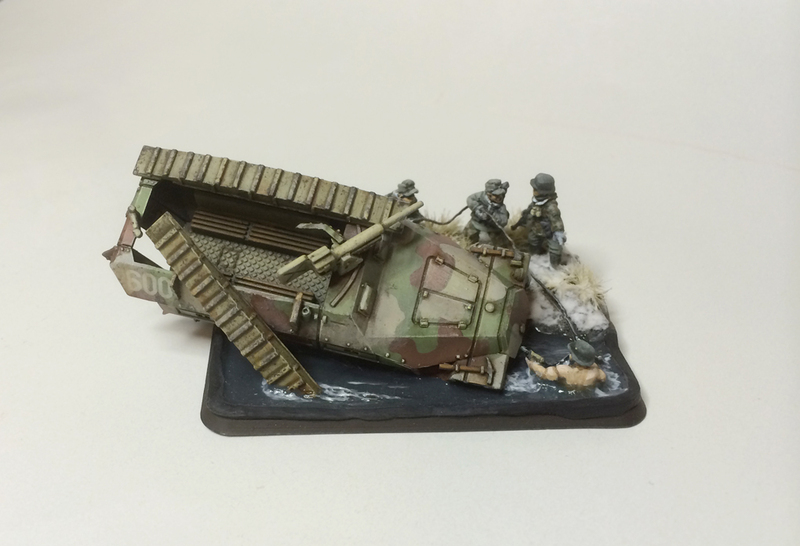 When Battlefront miniatures released their nice plastic 251 D halftrack kit I knew I had found the suitable vehicle for this objective marker and so the project was finally yanked forwards! At -45 the Allied air supremacy restricted the German troop movements severely and most of the maneuvering took place in the hours of darkness. The darkness combined with the narrow and treacherously slippery roads resulted in a multitude of accidents, such as seen here. On the vehicle I wanted to use some of the extra bits from the 251 kit, so I went with the type 7, that had an assault bridge onboard. 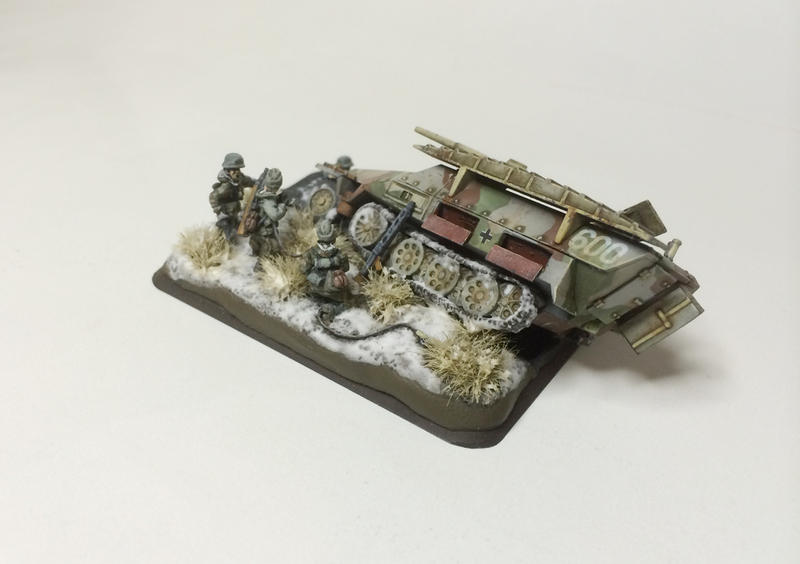 To bring more features and points of interest to the diorama, I also added the non-standard 37 mm antitank cannon to the halftrack, as I had seen a picture of such a vehicle. However, I have no idea whether such a subtype was ever used in Nordwind, so the piece seen here is semi-fictional. 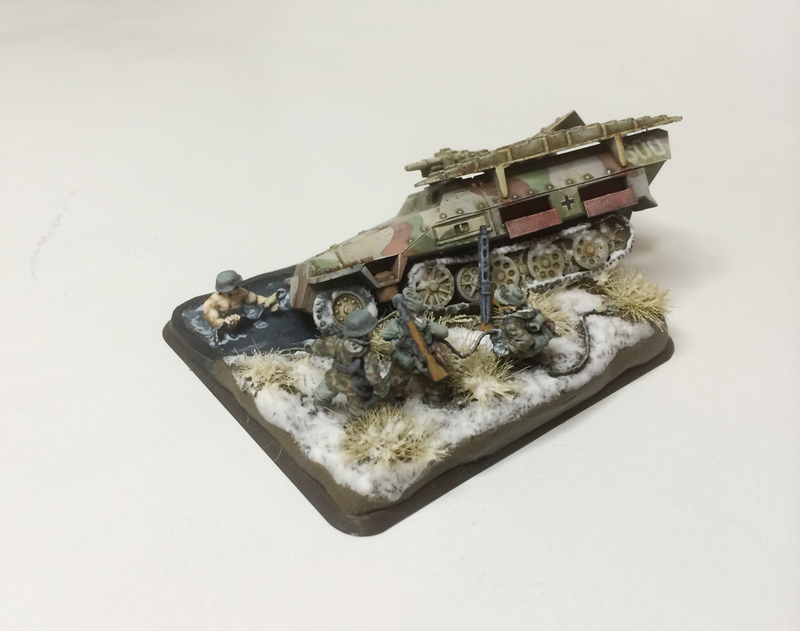 As I wanted this marker to fit in with the rest of my Nordwind army, I went with the snowy theme. Originally the plan was to make the river frozen over, but I got excited with Vallejo’s Still Water product and wanted to try it out. 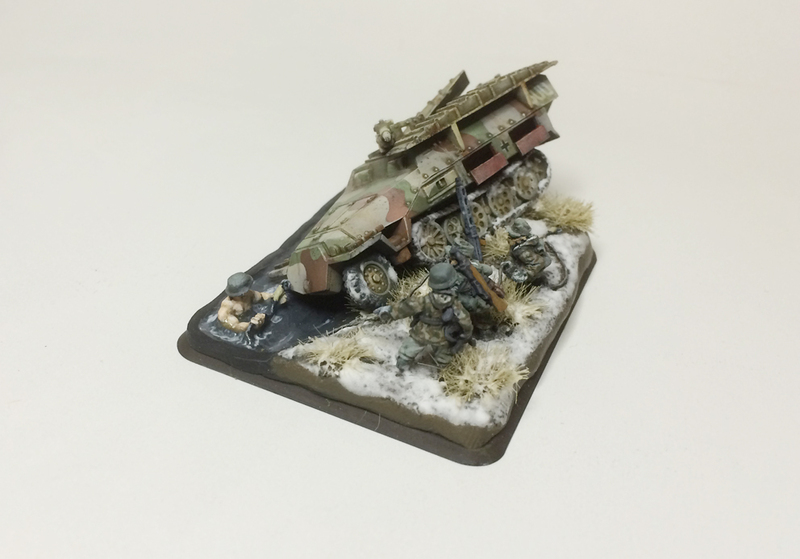 So, the scene was to be the snowy banks of a fast flowing river and the crew of an unlucky halftrack trying to get their SPW unstuck. I modelled the water mixing Still Water with tiny drops of acrylic paints to try and create the illusion of flowing water. I began with darker shades and then layer by layer made the mixture more light. Originally the water color was more brown, but it didn’t look very “wintery” so I added bluish tones to it, and in the end I think I overdid it some. I then added ripples to the surface using Vallejo’s Water Effects mixed with light grey and white tones. I’m not too happy with the water color nor the depth effect, but then again, it’s my first try at modelling water so I’ll blame it all on the experimenting on the go. When I was very nearly done with this piece, I botched up quite a bit. As I was applying matt varnish on the miniatures, I also airbrushed some on the water. This lead to all the shine and luster of the water feature disappearing completely! This was partly undone by adding a couple of thin layers of Still Water to bring back the shine. However, the matt varnish in between the layers left the overall effect a little dull. I would have liked to add even more, but the very limited space on the diorama made it quite impossible. The water was nearly overflowing already and I was afraid of messing things up even further trying to salvage the piece. So, when making model water do NOT varnish the water feature!